Codacy is a hosted automated code review service. Codacy automatically applies static analysis code patterns to your project and grades it so you can take a first glance of its health. 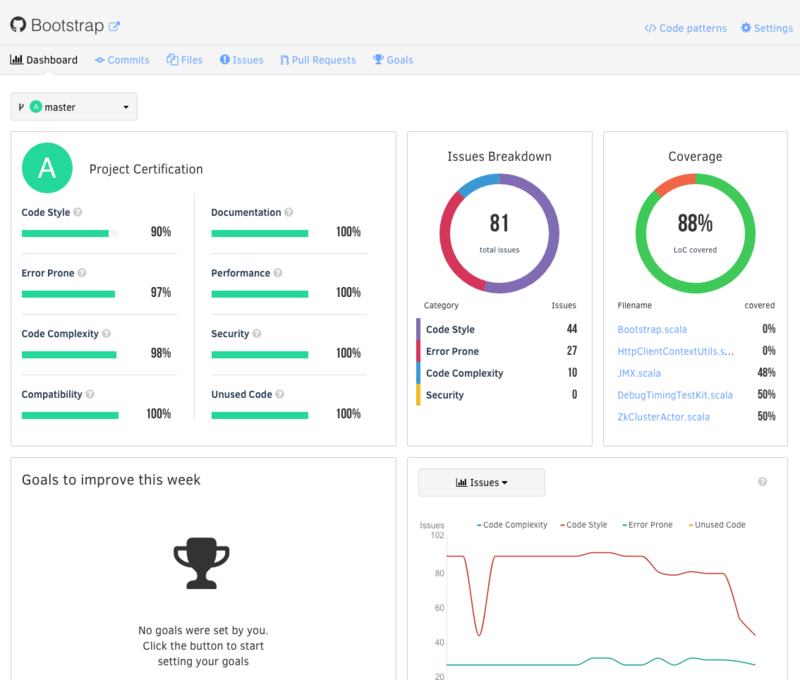 Codacy reports back to you the impact in code quality for every commit or pull request: new issues introduced, code coverage, code duplication or code complexity. We’ll also provide you with all the detailed information required to improve it, effectively helping you tackle your technical debt. You will be taken to the setup wizard if you haven’t already configured a project. When you start setting up a project you have to select your source code repository first. At the moment we support GitHub, Bitbucket and Git. If your repository is hosted on GitHub, then select ‘Import from GitHub’. If your repository is private on GitHub, select 'Include private repositories’ to grant additional permissions to Codacy, so that we can display private repositories as well. After finding your repository, select it and click 'Add’. If you wish to analyse other repositories as well there’s no need to repeat the wizard, just select multiple repositories before clicking add. If your repository is hosted on a provider other than GitHub, select 'Import with Git URL’. You’ll then be prompted to choose whether your project is publicly visible or private. If your repository is public, all you need to do is to provide the public URL of your repository and click 'Add project’. To a private repository, start by copying the Public Key generated by Codacy and add it to your Git repository. Then all you need to do is to provide the Git URL of your repository and click 'Add project’. And that’s it. After the first analysis you can customise the code patterns of your repositories, in the 'Code Patterns’ tab. Following is a list of technologies and languages supported by the Codacy. Migrating from one Codacy plan to another will simply alter the resource limits of the service. No data will be lost in any way, thus making it a safe operation. Codacy can be removed via the CLI. Before removing the add-on please take a minute to send us an email explaining what made you remove it so we can improve our service for future users. Heroku provides support requests for all add-ons through Heroku Support. If you have any questions or need anything you can add a ticket there and they will let us know. If you use Codacy Dashboard you can also contact us via our in-app support system. Additionally you can also contact us via email.